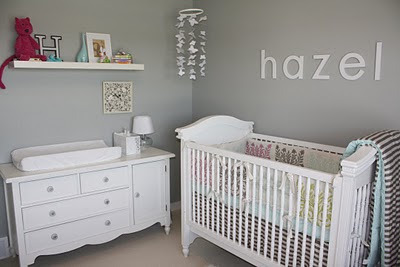 Daffodil Design - Calgary Design and Lifestyle Blog: nursery paint color. i love love this color. depending on the natural light in our home, the color looks grey-blue, or green-gray. it's versatile and a great basis to decorate upon. ps. the paint color in the photos appears to be much darker & muted. Absolutely love this colour! Do you know the manufacturer of the paint colour, "dish water"? Have googled the number you provided but not having any luck.